Pilgrim Congregational Church has been a part of the local Interfaith Hospitality Network since 2003. The Montachusett Interfaith Hospitality Network (MIHN) is part of the national Interfaith Hospitality Network system which began in 1988. In September 2003 the Montachusett Interfaith Hospitality Network opened to serve the Fitchburg - Leominster area. MIHN is a non-profit coalition of local congregations that provide temporary shelter to families in crisis. MIHN provides families and children with a temporary place to reside while they search for affordable housing. 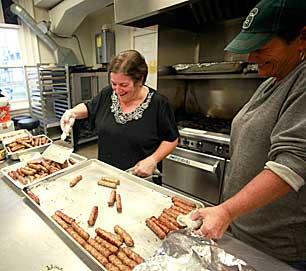 Volunteers from each participating congregation prepare meals, provide supervision, and lend a helping hand to families on a rotating weekly basis. Each congregation “hosts” our guests in a central location for one week at a time. Each Sunday the next congregation in the rotation takes over the hosting of the guest families. Volunteers from Pilgrim Congregational Church take place in the weekly rotation of congregations so that families can have the opportunity to get back on their feet and have a safe place to call home. Without the worry of where they can eat and sleep, parents can concentrate on working and saving money so they can afford to find permanent housing again.